Boiled peanuts in Hawaii. Photo courtesy of Sharon Maeda. Most long time Hawaii residents won’t think twice about it. But whenever tailgating or barbequeing, there’s hardly a time where you won’t find this pupus (i.e., appetizer). And this pupu is the boiled peanut. For most visitors, they won’t know what boiled peanuts really taste like. But when they do, it is almost a certainty that they will definitely like them. It’s safe to say that boiled peanuts and their succulent flavor are a part of the everyday comfort foods in the Aloha State. This is the story of boiled peanuts in Hawaii. 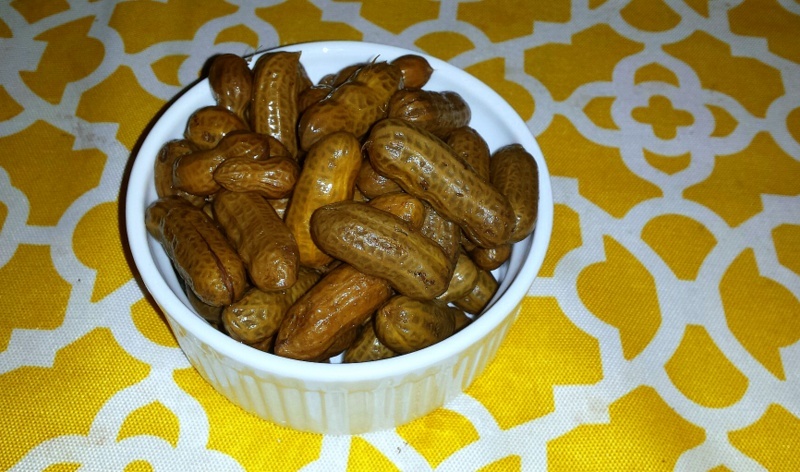 Most people believe the first Chinese immigrants introduced boiled peanuts into Hawaii. Many older local residents also fondly recall the days of the old termite-infested Honolulu Stadium in Moili’ili. This was where street vendors would sell boiled peanuts. They were one of the things you must eat when watching a high school football game in the beloved “Termite Palace.” After the games, you would see the stadium stands and the areas beneath them littered with thousands of empty peanut shells. It was, without a doubt, an essential part of the ambiance and experience of attending footballs games there. But for some reason, boiled peanuts have not gained the same type of recognition as other pupus in the Aloha State. Most of the attention has gone to the Hawaiian appetizer, poke . This is raw tuna chunks that people mix with seasoning, local seaweed and Maui onions. But despite its lack of recognition outside of Hawaii, you’ll find places selling boiled peanuts almost everywhere. This includes local supermarkets and mom and pops stores. However, most people will tell you find the best boiled peanuts are in places that specialize in them. These would be places such as Alicia’s Market in Kalihi, Fort Ruger Market in Kaimuki, Chris’ Peanut Shop in Waimalu and Waipahu. There’re also Marujyu Market in Pearl City and Ono Seafood in Kapahulu and more. Actually, boiled peanuts are relatively simple to make. Basically, all you need is some raw, unshelled peanuts. You wash them thoroughly. Allow them to soak for a while. Then boil them in water with Hawaiian sea salt, star anise and other spices for at least an hour. While the ingredients may be the same, the skill of putting these simple items together is the key. Additionally, you never know what secrets and techniques that professionals are employing to make their boiled peanuts stand out again the competition. So you just might be better off, time and taste-wise, going down to a store that specializes in boiled peanuts whenever you plan to try them in the Aloha State.